This toolkit book, published by Wiley Blackwell and part of an evidence based series for British Medical Jounral was a year in the making. 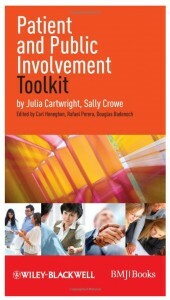 Sally Crowe and Julia Cartwright, together with editors Doug Badenoch and Carl Heneghan have been on an interesting journey to make the theory and practice of Patient and Public Involvement accessible, interesting and useful. The design is quick reference, digestible chunks of information, with lots of case studies and resources. We hope that the book will become a handy ‘aide-memoire’ for those practitioners that seek to engage, and involve patients, service users, carers and the public in service development and research.